If you already have a deck of cards, it's more likely than not that you've been using them wrong at least in some occasions. Now don't get me wrong, I don't claim to be a tarot authority of any sort, nor from the tarot police. But I've simply learned through my own unaided journey through tarot (I'm self-taught and later on, actively learned from other readers via blogs and online forums) that there are many many pitfalls a tarot rookie - and even a more experienced reader - can and will encounter. Because tarot cards are not easy to understand at first sight - after all, each has multiple and layered meanings, and can be more or less cryptic depending on the deck - the most natural thing to do is to ask another card to clarify the previous ones. And then another. And one more. And... that's where things go downhill. The problem is that the more cards are pulled, the more information is gained. Great, right? No. I firmly believe - and again, just based on my own experience - that one to four cards are more than sufficient to answer any question. If you still don't understand, ask another question. Maybe the wording of your question simply can't provide a clear answer. Yes and no questions are the hardest to get right, more about that soon. Did you forget your question in the midst of pulling more and more cards? That happens easily too. The best way to start working with tarot is to write the question down. If you use a mobile app, type the question down. Or use a journal, piece of paper, a post it note, your phone's memo option... anything goes, as long as you get the exact wording down. If the question itself becomes muddied and fudged in your head, the answers will be muddied and fudged too. Because each card has multiple meanings, a single card can tell a whole story. With tarot it pays to be patient. That sure is something I'm still learning. I used to be the queen of repeat questions and clarifiers. If I didn't get a card I understood (or didn't like the answer, let's be honest here...) I'd keep pulling more until I got one I understood/liked. But, was the answer correct then? 95% chance it was not. It is the nature of tarot that each card requires attention, focus, unravelling, meditating, even. They will open up, but only to the ones who wait, i.e. stay calm, patient and observant. This was already touched in the previous section but it's a slightly different problem than clarifiers. Nowadays, if I can't comprehend the message, I might say: "show me the message in a way that I understand" to direct my own mind and subconscious, and then pull another card(s). But this can't be done to death: I don't want to flood myself with irrelevant extra angles that cards so love delivering. Funnily enough, tarot has a mechanism to stop repeat questions. At some stage, cards just start giving nonsensical answers and often repeat cards like 9 Swords and 10 Swords: overthinking, overworrying and this matter is being thought to death, it needs to be put to rest. That's the end of story with that question, at least for now. As strange as it may sound, cards behave like a trusted but brutally honest friend. No matter what's the question, the first few answers for the same question are crisp clear honest. But if you keep repeating the question, the cards sort of "cave in" and either go on a blabbering mode (have you thought of this, how about that, you really should consider this...) or throw in a row of super positive or super negative cards, as if spreading one's hands in the air: "I can see you're not listening, here, have the answers you want OR fear the most, I'm done!". Well, truth be told, if people were not emotionally invested in the outcome, they wouldn't have invented tarot in the first place! Of course we read cards because we want to know answers to questions that matter to us most. Will I get the job? Will I succeed in this undertaking? Will I meet my dream partner? Will I marry soon? Will s/he like me? Will I have kids? Will I be happy next year? The trick is, however, to not be too attached to a specific outcome. Firstly, never ask a question you are not willing to hear an honest answer to. Don't ask "do I look fat in this dress"... or "when will I die" if you can't handle the answer (timing questions are horribly difficult anyway so you'd end up fretting for nothing, most likely). Secondly, accept that whatever the answer is, it doesn't mean you can never get around it. Yes, you might get a NO for "will I get this job". But that can mean that this specific job is not the best one for you and there is another better one in the pipeline, just stay patient and keep doing your best. Same goes for partners, or even children. Will I have a baby this year with a negative answer doesn't mean you'll never have kiddies. Tarot works best as a troubleshooting, problem solving and self development tool IMO, and you can't beat an obstacle and choose a different, more fruitful path if you can't identify the problem/obstacle in the first place. So sometimes negative readings are blessings in disguise as they warn you about an outcome and give extra time to prepare and change your plans. And sometimes, they actually show a negative outcome brought to you by... you. I've had more negative answers to my own job application questions than I care to remember. However, in half of the questions I learned later on that a) the job opening didn't go forward and no one was selected or b) I actually didn't want the job after some reconsidering! So, sometimes a NO answer can mean that you yourself will end up changing your mind in the future and YES was never a long-term possibility. Funny that! Unless you have a reliable, established system for knowing when cards mean yes and when they mean no, it's always better to ask something more open-ended or descriptive. Such as: what would be my best course of action in relation to... Or what should I take into account... Or how should I proceed in this matter. A snappy quote I once saw was: my deck doesn't come with yes and no cards, so it's not realistic to expect yes or no pop out. Each card has multiple, layered meanings, which can take positive or negative flavour depending on the question. Say, 10 Cups is one of the happiest cards in any deck: the attainment of dreams, culmination of happiness, the ultimate bliss. But you might not want to see that card pop up for your love interest and his/her current partner, in case you are sneakily hoping it would be on a shaky ground and you'd still have a chance in winning this popular person's heart. So, depending on a question, even the most positive card can take a negative vibe for you personally. 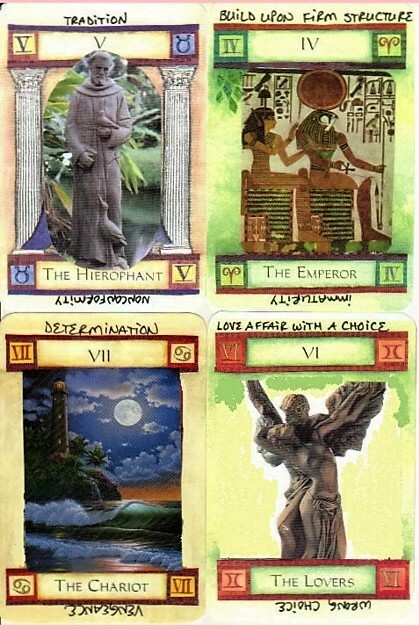 Some readers use a fixed system where certain cards or reversed cards mean no and certain others mean yes. Feel free to experiment and find your own system. I myself haven't found a fool proof system and I always treat yes and no questions with a pinch of salt, trying to see the context and the wider answer and angle the cards inevitably provide. It can be helpful, too, to not just expect black and white but to accept the gradual greys in between.